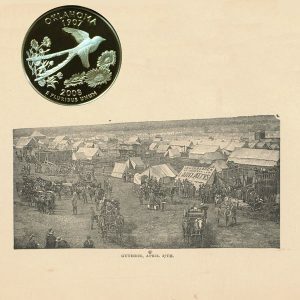 Today, the Oklahoma State Quarter Coin remembers when the Territory opened for settlement and Guthrie became a city on April 22, 1889. “The settlement of Guthrie has no parallel in the world’s history,” has been echoed and re-echoed from the rock-bound coast of New England to the wave-washed shores of the Pacific, and from the great frozen lakes of the North to the land of the pomegranate and magnolia. That is true, and it is also true that the world’s history furnishes no parallel in which a new country was opened to settlement as was Oklahoma. No new country ever offered such advantages in soil and climate. It was the first and only Territory ever opened exclusively to legal homesteaders. In all parts of the Union thousands had been waiting for years to secure homes within its borders. For over fifteen years the bayonets of the Government guarded its fertile valleys, wooded hills, its broad and inviting plains, against the industrial civilization of the white man. The eyes of the whole country were turned in this direction. Every movement by Congress in its interest was watched with the deepest anxiety, and when the news was flashed over the wires on the 3d day of March, 1889, that the bill opening Oklahoma had passed Congress and had been approved by the President, wild and enthusiastic shouts, not alone from the thousands awaiting on its borders, but from all parts of the Union, were heard. There was a rush towards its borders from every point of the compass. The old, gray-headed “Forty-niners” who participated in the California gold excitement smiled as they witnessed the rush. History was repeating itself. Combinations of men were organized with alacrity in all parts of the country for the building-up of towns and cities at advantageous points in the Territory. For days before the 22d of April, Guthrie and Oklahoma City were objective points with the masses. The Territory having been as a closed corporation to the public, its real beauties and advantages were comparatively unknown to the masses. It was therefore amusing to see with what eagerness any and all information relative to it was devoured by the thousands awaiting the hour for a forward movement. Guthrie, in its beautiful location, had an advantage over all its sister cities in Oklahoma from the start. Its nearness to the northern line of the Territory, the direction from which the larger portion of the people came, together with the prestige of the land office, made it the leading city in the Territory. It was named the capital by Congress, for the reason that so soon as the additional territory as provided for by the act of Congress passed May 14th, 1890, is opened, Guthrie will be the most convenient point for the people of the whole Territory. This, however, is a question for the people to decide in the future, and with her charming location, beautiful surroundings, and commercial importance, Guthrie may yet have the capital verdict rendered against her. Guthrie was spoken into life by fifteen thousand people on the afternoon of April 22d, 1889; and if fifteen thousand people assembled on the green prairie, with not a shingle between them and the blue dome above, can be said to constitute a city, then long before nightfall on that day Guthrie was a city indeed. It was a city of souls of active, enthusiastic humanity, with neither home or home comforts, with little to eat and less to drink; the cold surface of a town lot for a bed, and the chilly mists of an April night for a blanket. Before the setting of the sun on the 23d Guthrie was a city of tents. There were tents everywhere; tents of every style and every conceivable size, from that of circus proportions to the most diminutive playhouse make. There was neither street nor alley traversing this magical city of tents. As in coming to Guthrie, so in pitching their tents, there was a unity of action; the people seemed moved by the same impulse. To the right of the land office, where nothing but a green prairie was seen at twelve o’clock, two hours later was covered with tents. Turning to the left, nothing but tents met the eye. It was, in fact, a vast city of tents, with fifteen thousand people winding their way around among them as though they were following the trail of a wounded snake. On the day following, long trains, both from Texas and the north, freighted with lumber and other building material, also patent houses, finished in sections so they could be put up in a few moments, reached Guthrie, and the work of building the city commenced in earnest. Business houses and dwellings arose like magic. The machinery of the city government was put in motion, and its ordinances, whether wise or unwise, were generally obeyed, so desirous were all to see the city prosper. An occupation tax that would have been considered appalling by the people during the days of the rebellion was levied and paid. During the first week much inconvenience and suffering was experienced on account of the scarcity of drinking water. The Cottonwood river and the well at the railway station were the only sources of supply, and as the drain on the latter was beyond its capacity, thirsty mortals were left to choose between a parched tongue and the water of the Cottonwood. On the 26th of April, four days after the opening, a private well was sunk down on the west bottoms, from which a limited supply was furnished the people at the rate of twenty five cents a bucket or ten cents a quart. The lemonade traffic was enormous. At one time there were over one hundred and fifty of these dispensers of the limpid waters of the Cottonwood tinctured with acid and flavored with lemon plying their vocation in the vicinity of the land office. The long lines of men awaiting their turn at the post-office and land office were supplied by a bucket brigade of lemonade venders. The bill of fare for the first few days consisted chiefly of sandwiches manufactured weeks before and shipped to Guthrie at the opening, and ham and eggs. Quite a sensation was created a few days after the opening by a circular issued by the Cowling Bros., (afterwards proprietors of The Creamerie), that they were then prepared to serve meals from tables supplied with table-cloths, napkins, and crockery, with chairs for their patrons to sit on while taking their meals. So strictly was the law relating to the sale of intoxicating liquors enforced for the first few months after the opening of the Territory that it was almost impossible to procure any for medicinal purposes. Many of the pioneers, however, brought pocket editions with them, in case of snake-bite, centipede, or tarantula poisoning. Fortunately, however, there was no demand for liquors for that purpose, so the entire edition was exhausted as a preventive. The absence of whisky from Oklahoma during the first year after it was settled is considered by thinking men as one of the most powerful factors in promoting peace and good order, and especially is this true as it relates to the more densely populated communities, where conflicts over town lots were numerous, and sometimes heated. Whenever the people felt that they had grievances that demanded redress, circulars would be distributed and mounted criers sent out, notifying the people to meet on the Government Acre—the Faneuil Hall of the people—where, from a wagon or dry goods box—the public tribune–the people’s champions would make known the wrongs, which usually met with such an emphatic condemnation that they were seldom repeated. Although nearly all of the men chosen to administer the affairs of the city were charged with violating the law in entering the Territory, and although many of the ordinances passed by the council, and rules adopted by the arbitration boards, favored those who had violated the law, when the people entered a protest from the Government Acre, the redress was immediate and sure. By ordinance No. 37, presented by Senator Kelly, of Kansas, a member of the council, a man charged with entering the Territory illegally was put into possession of a town lot. Senator Kelly was the man’s attorney. The people spoke from their tribune, and in less than twenty-four hours after the passage of the ordinance it was repealed, and its author, Senator Kelly, was expelled from the council. The rightful owner of the lot eventually got possession. At another time the city police were ordered to eject a party from a lot on Second street, near Harrison, which resulted in drawing together several hundred people, some of whom jeered at the officers, for which offense one of their number, a young man, was arrested and taken to the city jail, followed by at least two thousand people. The excitement was at a red heat; threats were made, and preparations were begun to raze the jail to the ground, when the mayor became alarmed at the threatening aspect the affair had assumed, and ordered the young man released. And the order was not made a moment too soon, for just as the young man was set at liberty, Captain Cavanaugh, with a platoon of United States troops, came up Oklahoma avenue on the double-quick, and, as usual, his appearance was electrical in restoring order. In many instances where ejectment writs were executed by the city authorities immense crowds of men would assemble, and to guard against violence the troops would be called out, and without taking sides, their presence was all that was needed to preserve perfect order. The Oklahoma State Quarter Coin shows with an image of Guthrie, circa April 27, 1889.